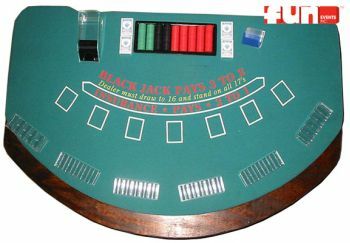 The Fun Events Blackjack Table Game Rental comes complete with table, assorted color poker chips, a deck shoe, cut card and 4 decks of playing cards. Blackjack table rentals are perfect for casino nights, fund raisers, casino or Vegas theme poker parties. Choose from our popular casino game rentals such as Blackjack, Craps, Roulette, Poker and other authentic Vegas style equipment.